In the first armed struggle for Khalistan, many Sikhs took part and attained shaheedi fighting the Indian security forces. Most of these Sikhs did not get the chance to meet Sant Jarnail Singh Ji Bhindranwala, but the awareness Sant Ji had created remained as the free voice of the Sikhs after him. 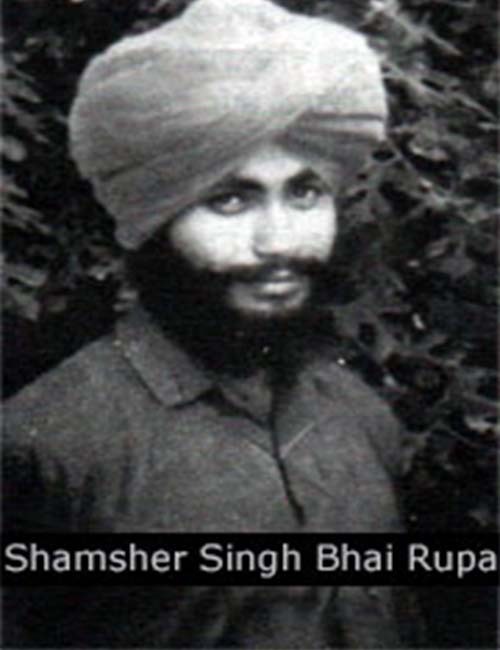 Bhai Shamsher Singh Bhai Rupa was also amongst the singhs who never met Sant Jarnail Singh Ji Bhindranwala but had listened to the cassettes of his. Bhai Shamsher Singh was born in the house of Sardar Jagga Singh and from the womb of Mata Manjit Kaur in the village of Bhai Rupa, district Bathinda. Bhai Sahib was the eldest of 2 sisters, Bibi Kulwinder Kaur, Bibi Jaswinder Kaur and 1 brother Bhai Avtar Singh. Bhai Sahib passed his 10th class at a local school and after became a Homeguard in Dyalpura. For some time Bhai Sahib did duties as a gunman of Deputy Commissioner of Law Courts in Ful, Sukhdev Singh. The person that has the warrior spirit in them can never accept the job of being a paid servant. These free souls do not like being a slave. People that walk with their heads high, can never be pushed under the knee of others. For these people freedom id life and slavery is death. It was during Bhai Sahib’s Homeguard duties, he established a relationship with the Jhujaru Singhs of his area. So many Sikh youths from Bhai Sahib’s area were already involved in the Sikh Freedom Movement. Now Bhai Sahib also had feelings for the Sikh struggle for Khalistan, but while still working, it wasn’t the right time to join the Sikh Freedom Movement. Short time later Bhai Sahib left his job and decided to join the Jhujaru Singhs the battlefield. While working away from home as a Homeguard, Bhai Sahib rarely visited home. One day while working Bhai Sahib grabbed all the weapons and ammunition that belonged to his work colleagues and went underground to join the Jhujaru Singh of Khalistan Commando Force under the command of Bhai Wassan Singh Zaffarwal. Now Bhai Sahib’s life came on to the tracks of a Jhujaru Singh. Bhai Sahib did many actions and punished many enemies of the Sikhs. In the end the day came for which every true Jhujaru Singh awaited eagerly. On 5th September 1992, Bhai Sahib was involved in a fierce encounter against the Indian security forces between the villages of Jalal and Hamirgarh. Bhai Sahib fought for many hours and caused damage to the Indian security forces. The CRPF were closing on to Bhai Sahib and soon a bullet his Bhai Sahib, short while after that Bhai Sahib drank the nectar of martyrdom and became a panthic shaheed.